Installation of Keysight (Agilent IO) Suite installs a driver that may interfere with the operation of Pickering Interfaces switch cards. 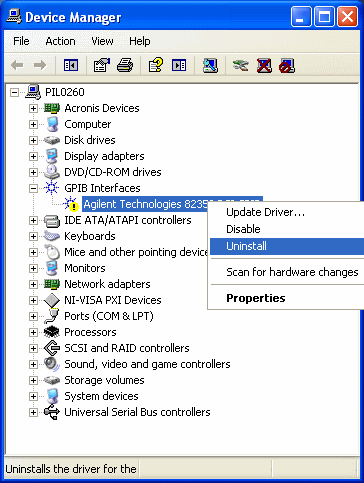 The Keysight driver package installs a set of INF files in the Windows/System/Inf folder, one of these includes a definition which assumes that any device containing a 9050 PCI interface chip is an Keysight PCI GPIB card. Any Pickering card installed after the Keysight driver may be installed as an Agilent card, and will fail to appear as a valid Pickering device. When this happens, the card appears under the GPIB Interfaces section in Device Manager. You may choose to edit the Agilent INF file to remove the interfering entry, remove line 84 'Agilent.DeviceDesc9%=82350gpib,PCI\VEN_10B5&DEV_9050' from agtgpib.inf. Of course if you are using an Agilent GPIB card, this is not a suitable solution. In addition subsequent reinstallation of the Agilent software may reintroduce the problem. The better solution is to uninstall the Pickering driver from all affected cards, and then to re-install, selecting the options to select a driver, and to then explicitly select the Pickering driver. The following screen shots show the process. Note: If the Pickering module has already been installed as an Keysight GPIB card it will appear in Device Manager as shown in the image above. Right click on the entry and uninstall it. Then either go to the Action menu and click on 'Scan for hardware changes' or re-boot the system; in either case the 'Found New Hardware Wizard' should be invoked. Choose "No, not this time" and click "Next"
Note that the Agilent software tries to recognise the module as an Agilent device. Choose "Install from a list of specific location (Advanced)" and click "Next" Choose "Don't search. I will chose the driver to install" and click "Next"
Select the "Pickering" entry in preference to the default and click "Next". The installation process will then proceed normally.